Tasiilaq, June/July 2015. Are there plants in Greenland? Yes, many! Like these little succulents that can be found in town all the way up to several hundred meters in the hills. Over the years there have been a lot of Frequently Asked Questions (FAQs) here on the Adventures of a Polarphile blog. Some are related to travel in Greenland while others are about me and my personal experiences. I have compiled the questions and my answers here. Have you found any books, publications or resources for learning Greenlandic languages in English? Is it best to fly to Iceland first? What do I need to know before traveling to Greenland? I saw your photos [of polar darkness] and would like to know whether the dates are really that late in Nov? I was told it’ll be dark, no sunlight the whole day by late Nov.
Will it be worth traveling [to Greenland] in early winter? When is the best month to visit Greenland for hiking and trekking? Do you have any recommendations for favorite treks? I’ve read that the locals sell rough rubies from the hills [in Qeqertarsuatsiaat] – do you recall seeing anything like that? AC plug – is it the same as in Denmark? Any ideas on where I could find the [House Hunters International: Greenland] episode? So you’re an American living in Greenland? Can you talk a little bit more about how you came to be connected to Greenland? Do you know anyone who moved [to Greenland] and stayed? Could I interview you for my blog? Or would you be interested in doing a [guest post]? 1) LANGUAGE – Have you found any books, publications or resources for learning Greenlandic languages in English? I’m especially interested in learning East Greenlandic (tunumiisut) as I love the area and would like to be able to communicate better. I don’t know any Danish unfortunately, so probably this limits the number of useful resources! 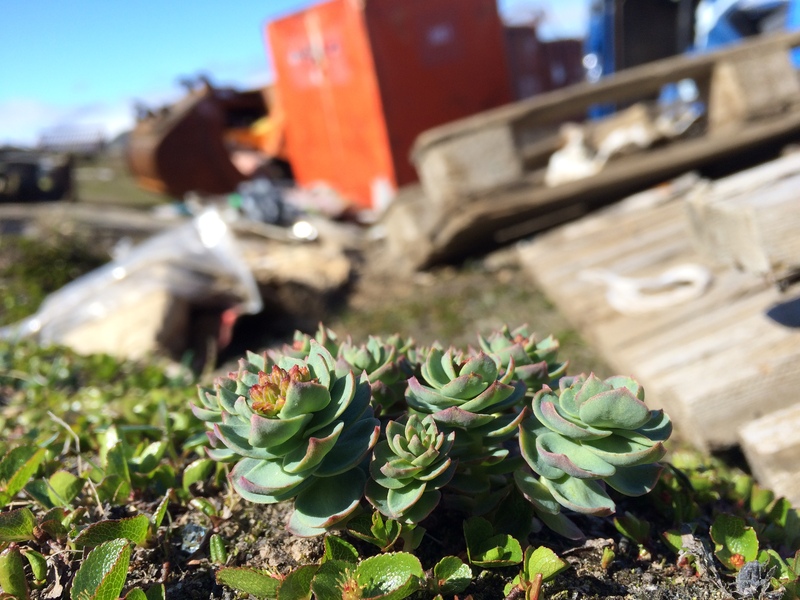 Yes, there are a few rare resources to learn Greenlandic in English. There is a two-part DVD series called Learn Greenlandic with Per Langgård. There are also a few Greenlandic lesson courses in English on Memrise. I have used both of these resources and highly recommend both. For more info on Language in Greenland, see Tips for Tourists in Greenland. 2) TRANSPORTATION – Is it best to fly to Iceland first? For those traveling from North America, Iceland is absolutely the best stepping stone to reach Greenland. It will involve an approximately 6-hour flight from North America to Reykjavík followed by a 2-3 hour flight from Reykjavík to Greenland. It is possible to reach 5 different locations in Greenland (Ilulissat, Nuuk, Narsarsuaq, Kulusuk, and Nerlerit Inaat) directly from Reykjaviík via 2 different airlines (Air Greenland and Air Iceland). Some of these routes are seasonal while others run year-round. For those traveling from Europe, Iceland is one possibility to reach Greenland if you are interested to combine Iceland and Greenland in the same holiday. Otherwise, there are also direct flights from Copenhagen, Denmark to Kangerlussuaq, Greenland via Air Greenland. Read more in my How to Get to Greenland post and my Americans in Greenland category. 3) TRAVEL TIPS – What do I need to know before traveling to Greenland? I have quite an extensive list of topics in my Tips for Tourists in Greenland page covering everything from phone service to food options to clothing suggestions. 4) POLAR DARKNESS – I saw your photos [of polar darkness] and would like to know whether the dates are really that late in Nov? I was told it’ll be dark, no sunlight the whole day by late Nov. The photos this question refers to are in my Polar Darkness in Greenland post. And yes! The photos in this post really are from late November early December as listed. At this time of the year at this location (Ilulissat, 69*N), there are approximately 3 hours of sunlight during the middle of the day with 1-2 hours of dusk/dawn twilight before and after. However, if you should be further north around 72*N or higher, then the image of darkness all day long is more accurate. I consciously make a point to note the date and time of photos whenever possible because I imagine that people are interested to know what Greenland looks like at certain times of the year. It also helps to break pre-conceived notions that Greenland is pitch black with waist-deep snow 365 days a year. 5) TRAVEL SEASON – Will it be worth traveling [to Greenland] in early winter? Winter (November – February) is not the primary tourism season in Greenland, but that does not mean a holiday during this time is out of the question. A winter holiday gives a chance to see Greenland in a truly unique way and at a time when you very well could be the only tourist in town. There is snow that creates a surprising amount of ambiance, the Northern Lights can easily be seen on clear nights in the dark sky, the days are getting shorter and shorter, candlelight makes everything very cozy, and the Christmas stars go in the windows at the beginning of December. If you’re traveling as a couple, it could be the perfect romantic getaway destination! About air travel, it will require a bit of flexibility and open-mindedness on your part. If you are traveling to Greenland via Iceland, then there are typically only 2 flights a week via Air Iceland, so you will have to plan accordingly. If you are traveling to Greenland via Denmark, then the flights are a bit more frequent (4-5 times weekly) via Air Greenland. And you should always be aware that weather has the possibility to delay or cancel a flight. That’s just how it is in the Arctic. Hotels are always open throughout the year as they cater just as much to domestic tourism as to international tourism. Most restaurants will still be open throughout the year as, again, they rely heavily on domestic patronage when tourists are few and far between. Tour operators commonly take time off in the winter season, so be sure to communicate with any tour operators you are interested in well in advance of your trip to ensure their availability and to leave enough time to make alternate arrangements in Greenland, if necessary. 6) HIKING – When is the best month to visit Greenland for hiking and trekking? Do you have any recommendations for favorite treks? Read my Ultimate Greenland Hiking Guide on visitgreenland.com. My personal favorite month for hiking and trekking is September (early to mid month) for a number of reasons, but June-September is the general hiking season in Greenland. First, the temperatures are a bit cooler. You would be surprised how warm it can feel in Greenland in summertime. With no humidity and no trees for shade, the heat can wear on you! Depending on which region you are in, average temperatures are 50-75*F (10-23*C). Second, the mosquitos have died down. The massive post-spring snow melt leaves a lot of wet ground, and thus, the mosquitos. Third, it’s just plain beautiful! Autumn is short, but it’s autumn nonetheless. There is low shrubbery, succulents, small flowers, and other ground coverage that changes color to orange and red. The Arctic Circle Trail in Destination Arctic Circle is by far the longest route you can find in Greenland (100 mi/160 km) and it is so very unique because one can see so many different environments. You start inland in an Arctic desert climate (Kangerlussuaq), traverse ever-increasing hills and tons of lakes, and then you end at the coastline (Sisimiut). The Oqaatsut Trail in North Greenland is nice for a day hike route (13 mi/21 km) because it connects Ilulissat, a larger town of 4500 residents, with Oqaatsut, a small settlement of approximately 50 residents. If you walk town-to-settlement, you get this feeling of getting further and further into remote lands. If you walk settlement-to-town you get this sort of explorer feeling of walking to find the next biggest place. There’s possibility for one-way boat transfer, and there’s accommodations at both ends. For an even shorter half-day hike, there is the Blue Route in North Greenland (4.5 mi/7 km). This one is nice because of its proximity to the Ilulissat Icefjord, a UNESCO World Heritage Site. There’s nothing like walking under the Midnight Sun with the mountains on one side and the ice mountains (monstrous icebergs) on the other. Then of course, if you’re a mountain climber looking to get to the tops of peaks, there’s a classic must-hike peak in nearly every single town, such as Ukkusissat (a.k.a. Store Malene) in Nuuk. 7) RUBIES – I’ve read that the locals sell rough rubies from the hills [in Qeqertarsuatsiaat] – do you recall seeing anything like that? I have been to Qeqertarsuatsiaat myself once back in 2012, while on board the coastal ferry called Sarfaq Ittuk. Do you know the show called Ice Cold Gold on Discovery Channel? In Season 1, the mining team called Sixty Degree Resources hunts for rubies outside Qeqertarsuatsiaat in a place they dubbed The Red Zone. They were extremely successful in their findings! There ARE locals who hunt for rubies in Qeqertarsuatsiaat, and there was even a man who had a very fine shop where he cut the rocks, polished the stones, etc. and even sold them to tourists when they came through on Sarfaq Ittuk, the coastal ferry. In fact, you can see that I mention him in #4 on my Greenland Wish List post. I have also heard that a local company in Nuuk called Arctic Boat Charter has created bespoke tours for people interested in visiting mineral sites. However, there are strong regulations about tourists removing raw materials from Greenland. 8) AC PLUG – is it the same as in Denmark? Yes. 2-prong plug. Iceland also uses the same one. 9) HOUSE HUNTERS INTERNATIONAL – Any ideas on where I could find the [House Hunters International: Greenland] episode? I would imagine if there is an official link anywhere that it is via the House Hunters International episode guide. The Greenland episode, entitled Detour in Life to Greenland, is Season 66 Episode 1. By the way, the star of the show is my friend and colleague who also keeps a blog about Greenland. Check her out at The Fourth Continent! 10) NATIONALITY – So you’re an American living in Greenland? 11) PERSONAL CONNECTION – Can you talk a little bit more about how you came to be connected to Greenland? It all started one day in November 2011… read about it on my About the Author page! 12) IMMIGRATION – Do you know anyone who moved [to Greenland] and stayed? Present company aside, of course, I have a handful of friends who have no Greenlandic heritage but who have made Greenland their home, and I know of many handfuls more. 13) GUEST BLOGGING – Could I interview you for my blog? Or would you be interested in doing a [guest post]? Sure 🙂 I always try to take the time to answer everyone’s questions and comments to the best of my ability. Plus, I take it as a compliment that you want to hear more from me. Please write to me via a comment and include your email address. Do you hear from the American people born at Narsarsuak in the 1950’s? Are there many of us around? I still have my Greenland silver spoon with the glazed logo on the handle I assume were given to all born there – and lots of pictures, and stories. My family left with the closing of the base, and my passport has Narsarssuak Greenland for place of birth, which must be pretty rare. Thanks for the message and the readership! Wow – you have a very interesting story 😀 Nope, to be honest you are the first person I have encountered (virtually or physically) to say they were an American born in Narsarsuaq. I would love to see a picture of that silver spoon, and any others! If you feel like sharing them, send a mail to me at sarah@greenland.com. Do you have an American passport?? Was it like being born to any other American military personnel abroad – you are born an American citizen, etc. ?